So where did we leave off? Ya, storage space issue. 5 yr olds nowadays have way too many toys. Our daughter is no exception. As soon as she started using the room, we faced two major issues; find a storage solution for her toys and a fast growing jewelry collection (thanks to two grandmas who absolutely adore her). Oops, how can I forget all the artwork by my two mini Picassos? The right side of my brain (they say that’s where all creativity is 🙂 ) went into overdrive and I managed to come up with this. The fuchsia ottoman doubles as a cozy resting corner and storage. The end table drawers are for her precious collectibles….mostly rocks, stickers, and an endless supply of cards (with pics of a girl or hearts) for friends. The storage unit has bins for Barbies, babies, headbands etc. The box on top of the unit and the jewelry tree stores all her jewelry and hair pins/bands. The large green bin in the corner provides more room for favorite stuff toys. Under the bed; more bins for dress up and pretend play toys, extra floor pillows for friends when they come over for a play date. The kids’ art work is framed using inexpensive frames from Walmart. 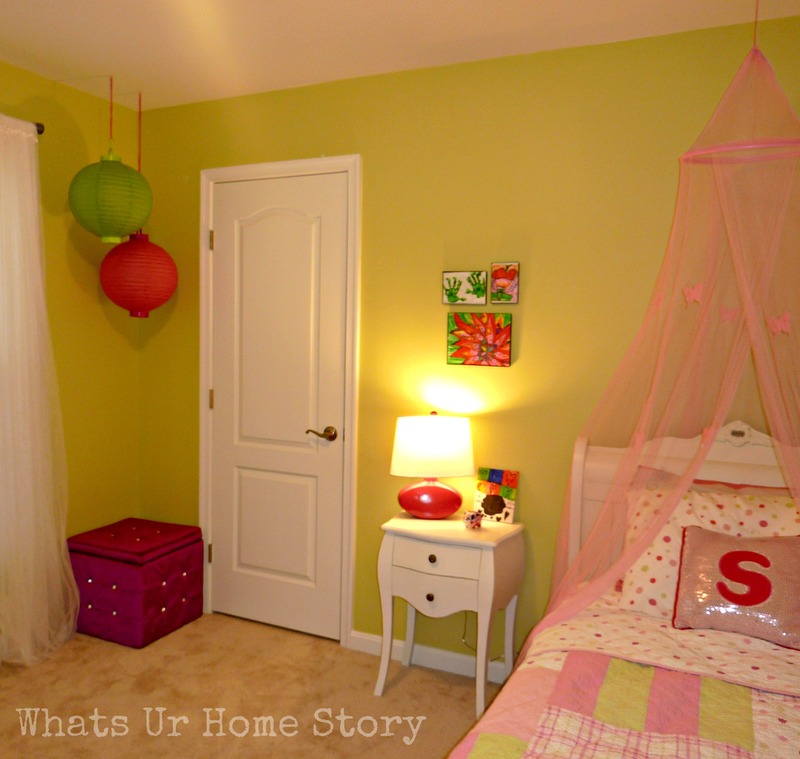 The funniest thing about this makeover: we had so much trouble hanging those battery operated paper lanterns. Luckily I had some fuchsia raffia (the lanterns are pretty light, so that worked) to hang them. Now, for the hooks. After rummaging through our tool box and around the house for over an hour we couldn’t find a single one. All we had were bulky ones that would stick out like a sore thumb. How do we know? We were dumb enough to actually try it. Call me crazy, but I wanted to finish it that very night as B was leaving on a 2 week long business trip the next day. So we turned to our next option, picture hooks, the ones you use to attach the wire to a large painting frame. They were small enough and worked great until the kids stormed in to check on the progress. They were so fascinated by the lanterns that they kept playing with the switch and oops…the whole thing came down. I so…didn’t have the time or patience to spackle the hook hole and start over. Guess what came to our rescue? Trusty old white glue. After an overnight of curing, we were good to go. It’s been a few months now and we are super happy that our cheapo tacky fix worked. As usual here is the breakdown; we spent a total of $820.17. I can imagine a very very happy 5 yr old who would refuse to leave her room. The canopy looks great and dreamy. Ya Sunita she was definitely happy. She is 6 now and still enjoying the room. She always says she fels like a princess sleeping under the canopy. The butterflies glow in the dark. So that adds a nice touch. The toughest part is to get her to keep it clean. I guess I’m the only lucky one to have seen these in person!! :)..& ofcourse, the room looks even prettier in real…Good job, Vidya!! Thank you Kala. Sriya loves butterflies one of her favorite things to draw all the time. i loved this…if i were there,i would have never got out from such a lovely room. Aishwarya, thank you so much for taking the time to leave a comment. Very pretty room, just right for a daughter of your age. I love all the little, little details in the room. Thanks for dropping by my blog,it is always nice to have new friends. Thanks Rama, thanks for dropping by. I love HomeGoods as well.Good job on the decor.Love your Formal Living Room colors.I did my daughter’s playroom in the new house as well.Still in process…but it has more from Ikea than HomeGoods.Hope to see more fab finds from HomeGoods from you. Garima, thanks for stopping by and taking the time to comment. Please do send in pics of your daughter’s room when it is done. Thanks so much for dropping by. Yes, the kitchen is coming up. We really haven’t done much there, just painted. Have plans to do a glass tile back splash. But we are not getting the time. it sure is on the cards, may be later in the year. Love the wall color that you have chosen…. 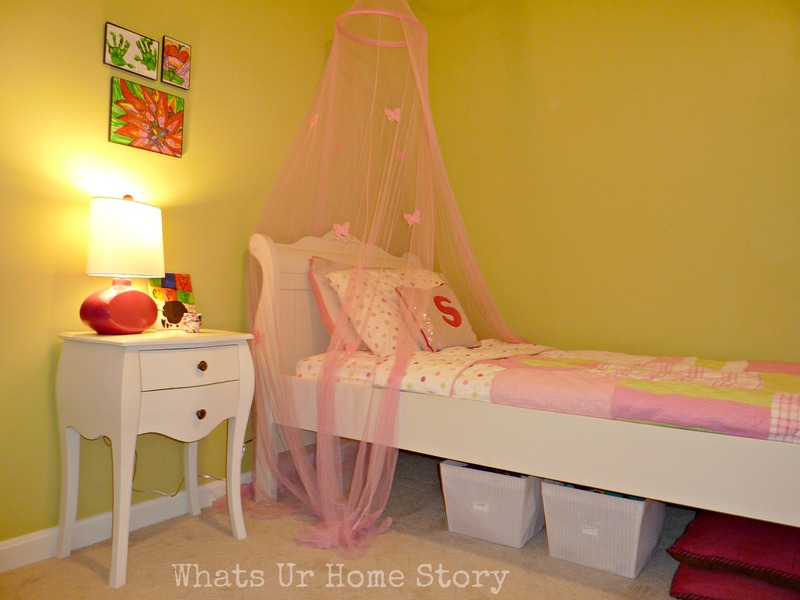 Love the canopy and the storage ideas that you have adapted…. !! Love those butterflies ( I have stars that glow in the dark on my ceiling.. Love watching them at night 😉 ) …. Beautiful girly room. I wanted to know where did u find the fushia storage ottoman? I bought it from Ross. At the bottom of the post there a is a source list showing where I got everything from and how much it cost. Super cute!!! 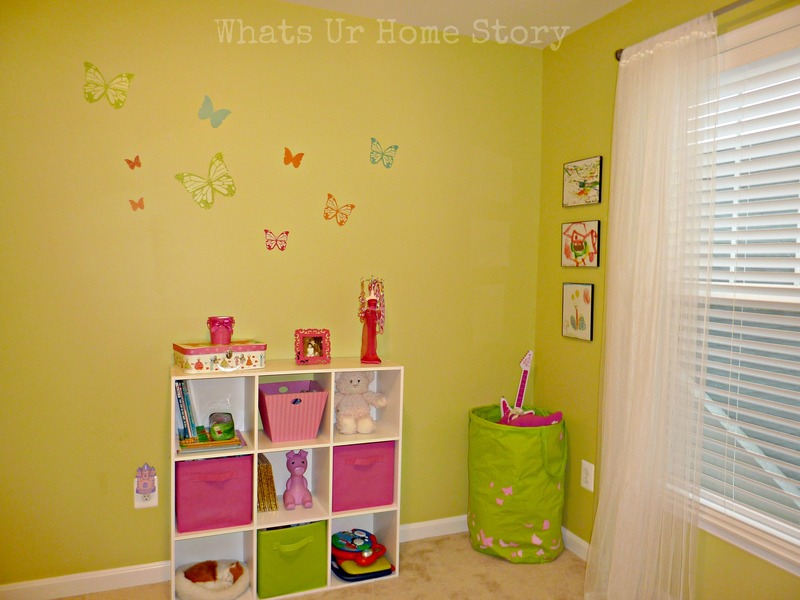 Great ideas I can implement into my daughter’s room which I’m planning to rearrange/redorate. It’s funny, my daughter has that same Quilt and her first initial is also “S”. I have to take a trip to Home Goods and check Ross for that beautiful ottoman. Aww…that’s cute. She relaly wanted that ‘S’ when she saw it. Do send me pics of your room. Great job and happy 3 month blog anniversary! Thanks Julie. 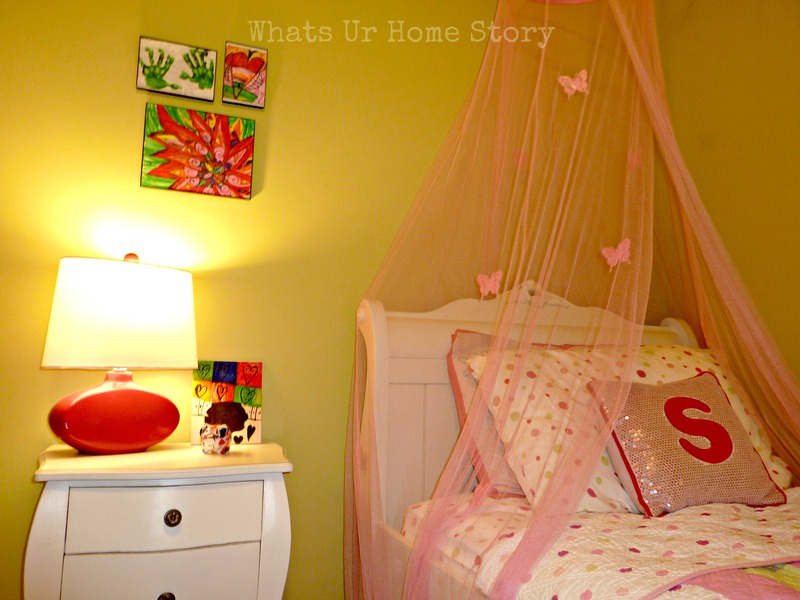 Love your daughter’s room, especially the coral accent color. I wish I had such a cool room when I was a kid. Who doesn’t want a canopy like that? It’s so dreamy and princess-y! The bedding was a particularly good score, in my opinion. It looks like a pattern I have seen at Pottery Barn Kids, but you can’t even get a pillow case for $30 there. I agree that 5 year olds have too many toys! I am owner to one myself LOL. She and her older sister have way more toys than I ever had over the course of my lifetime. Books too! I swear, I need to hire a sherpa just to lug their stuff around! That is so true! The toys and the books! And they don’t even play with half the stuff. Glad you like the room. LOVE the color scheme (especially since my daughter has the same one). The canopy over the bed with the butterflies is so cute, I told my daughter she couldn’t have one since her bed is a double, but I might change my mind, it’s pretty adorable. Thanks for visiting Jessica. My daughter loves the canopy. Those butterflies glow in the dark too. How did u fix canopy to the wall?iam sorry is it silly question? The canopy comes with a hanging kit. It is basically one of those question mark shaped hooks that you can screw into the ceiling. You will get these at any hardware store. The canopy is not very heavy or anything so this simple solution works. Thank u vidya for a quick reply.Your blog is very nice,u know I slept at 1:00 clock addict to ur blog,I think this is the first time I saw home tour (indian looks)we r in Detriot,iam lucky to found ur blog,I have lot of questions pls share closet organization,puja mandhiram,kitchen……pls,thank u.